Large corporations such as FedEx and Patagonia are seeing the light and making the switch to solar power at some of their facilities. At first glance, the 66.6-kilowatt solar system at Patagonia'sVentura, California, headquarters has little in common with FedEx's 904 kW installation at its Oakland, California hub other than solar energy production and a West Coast address. After all, Patagonia's 360 photovoltaic panels are mounted on top of three eye-popping carports designed by a Seattle, Washington architect. FedEx's system, on the other hand, consists of 5,769 pv modules mounted on two rooftops at its sorting facility in the mostly industrial Oakland International Airport. At the time it was installed in 2005, the FedEx Express project was the largest corporately owned photovoltaic system in California. But dig a little deeper and similarities between the two projects become apparent. Both companies turned to Sharp Electronics for their photovoltaic cells. Both companies conducted energy audits as part of their shift toward alternative energy sources. And both have long-term commitments to support renewable energy where it makes sense in their operations. "We are interested in trying to reduce our overall impact from an environmental standpoint, and our energy usage is one of the areas where we can do it," says Jill Dumain, director of environmental analysis for Patagonia. Working with an architect, Patagonia Inc. developed the idea of installing solar panels on custom-built carports on an existing parking lot at the company's headquarters. Some 360 photovoltaic panels are mounted on top of the carports. "We had research in place, so we decided if we wanted to do this long-term, the roof was only enough to do a percentage. We had to find an area where it wouldn't change over time, no matter what. The only free space was the parking lot." Working with architect Ron Rochon of the Miller/Hull Partnership LLC of Seattle, Patagonia developed the idea of installing solar panels on three custom-built carports on an existing parking lot. But they weren't just any carports, Dumain says. They were built to accommodate trucks and a wind load that might otherwise pick up the structures. Since Patagonia's headquarters is located in downtown Ventura, Dumain says the proposed structure had to undergo city design review. "They are paying more attention to the downtown area, which is great," she says. Patagonia then turned to the Ventura general contracting firm Hartigan/Foley, since it had worked with them on other projects during the past 20 years. "It was a real team effort," Dumain says of the company's working relationship with Hartigan/Foley and Miller/Hull. Two years ago, she and two principals from Hartigan/Foley attended a solar expo to learn more about available options. "We talked to a bunch of different builders, and we talked to solar contractors," Dumain says. "As we started talking to the different folks, we found they were very, very environmentally motivated. "As the three of us kind of wandered around, we found who would work with us. Sharp saw some potential because it was more of a design project and not just a standard carport." And Dumain's experience at the solar expo is not unusual, says Mark Cortez, marketing director for Sharp Electronics' Solar Energy Solutions Group in Huntington Beach, California. "We work with both solar contractors and general contractors," Cortez says. "We certainly have design teams available here to work with folks. We do a lot of residential installation designs for new project developers who want us to work with some of their existing contractors." In Patagonia's case, Cortez says the architect had designed the carport to integrate with the look and feel of the existing buildings. Sharp made recommendations about tolerances and the way the 185-watt panels should be mounted. Once the plans were approved, Dumain says they broke ground in May 2005 and turned on the system in September of that same year. The panels feed electricity through a meter and on to the Southern California Edison power grid. Patagonia continues to draw its electricity from the grid as it has in the past. At the end of each billing cycle, SCE trues up the bill. If the generator uses more electricity than it produces, it pays the difference. If it generates more electricity than it uses, it does not receive payment from the utility. Instead SCE simply zeroes out the bill. 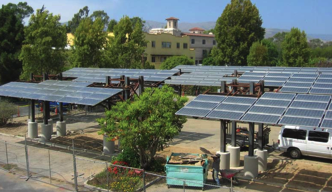 Based on the angle of the sun, the panels' ratings and the number of sunlight hours, Dumain originally had estimated the system would provide about 10 percent of the campus' energy needs. Although the system hasn't been running for a complete year yet, she says the actual amount of electricity it produces appears to be slightly less than expected. "I have no idea on the payback, and part of that comes back to what it's actually generating," she says. When FedEx decided to use solar generation in one of its facilities, it first examined where it would make the most sense among its numerous coast-to-coast locations, says Mitch Jackson, managing director of environmental programs in Memphis, Tennessee. "California made the most sense because of its increasing energy costs and robust commitment to incentives," Jackson says. "Our West Coast hub is in the city of Oakland, which has an ambitious goal of five megawatts of renewable power." At the same time, FedEx officials conducted an energy audit and an analysis of how solar would perform at the hub in early 2004. The 350,000-square-foot facility at Oakland International Airport handles an average of 260,000 pieces per day and features 20 aircraft gates that serve an average of 85 national and international flights daily. Because of its airport location, FedEx was limited to a rooftop installation. The company approved the proposal in fall 2004. "We simply ran out of roof space," Jackson says. "We put panels on the main distribution facility, the canopy of the distribution facility and put them on one of the auxiliary buildings as well. We were only interested in putting them on the roof, given the fact it's an airport location and land is at a premium." FedEx planes flew the more than 300,000 cells from Sharp's manufacturing plant in Katsuragi, Japan, to the Memphis assembly plant. The transport was standard business since Sharp is a FedEx customer, Jackson says. "The nice feature of this project for us is we were basically fulfilling our standard role in the supply chain," he says. "We were moving the cells that would ultimately end up at our West Coast hub--in this case, our transportation network benefited FedEx, since we're also the customer." Although the 300,000 solar cells involved in the FedEx project may sound like a large number, Sharp's Cortez says it was only a small part of the company's overall 400 megawatts of annual cell production. FedEx worked with PowerLight Corp. of Berkeley, California, which designed and built the project. Jackson attributes the easy installation to PowerLight's patented PowerGuard solar tiles and their interlocking tongue and groove system. "It was a straightforward, clean install," he says. "So far, it's been plug and play. Washing is the only recommended maintenance protocol. And coincidently, that was one of the system's appeals to us. We're able to concentrate on what that facility was really designed to do, moving our customers' packages." The panels cover 81,000 square feet of rooftop, which needed no structural reinforcement to accommodate them. FedEx performed only minor repairs to the roof membrane before the panels were installed. 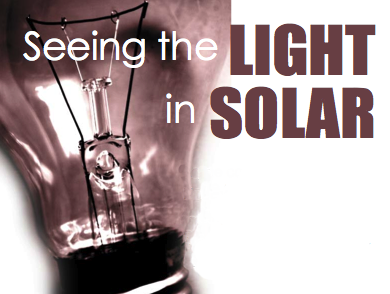 The solar system is designed to provide about 80 percent of the facility's peak electrical demand. Although it has not been running for a complete year, Jackson says it appears electricity production may exceed his hopes. From the time the switch was flipped in August 2005 until late July of this year, it had generated about 1.1 million kWh of power. Once the operating year is complete, Jackson says FedEx officials will review the system's performance and determine whether to explore solar projects at other sites. "These systems have high capital costs," Jackson says. "One thing I'd like to see is the option to lease solar electric systems under long-term leases because we lease the vast majority of our facilities. It doesn't make sense to buy a system that will last 30 years for a facility that has a 10-year lease." Regardless of future solar installations, he says FedEx has committed to buying more than 50 million kWh of renewable power this year.